Rosemary and thyme are classic flavours to match with lamb, but lots of other herbs also go well with it. Personally, I find lavender wonderful. There are just two things to remember: measure it carefully (as too much can make your food bitter) and only use the flowers, not the stalks. A few years ago, while on holiday in Provence, we were walking to town to get some baguettes and pains au chocolat for breakfast when we found ourselves amid a sea of lavender fields. The colour and aroma were truly magical. On the way back we picked huge bunches of it. Some we tied together to take home and dry, and some I decided to put in the pot… this is what I made. ✱ You need to prepare this dish the day before you want to eat it. Put the lamb in a clingfilm-lined roasting tin that fits in the fridge and season with black pepper. (Don’t season with salt now, as it draws the blood out of the lamb. Salt is always added just before cooking meat.) Add the garlic bulb and 6 heads of the lavender and pour 90ml of the oil over the top. Rub the seasonings in thoroughly, then wrap the lamb in the clingfilm and leave in the fridge overnight. ✱ Preheat the oven to 200°C/400°F/gas 6. 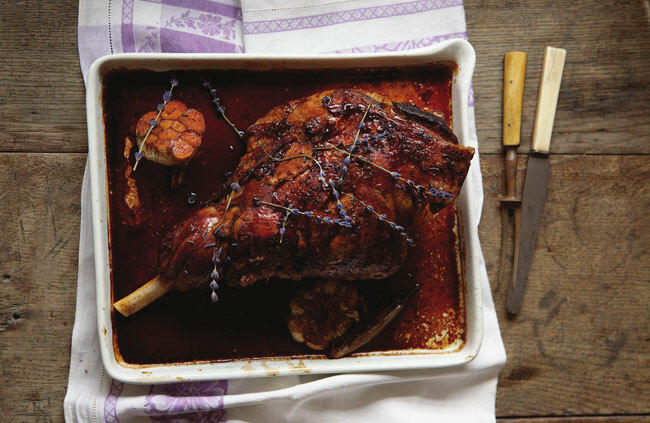 ✱ Unwrap the lamb, put it back in the roasting tin with the garlic bulb and dab it with kitchen towel. Pierce it several times with a sharp knife and push a halved garlic clove inside each opening. Add the shallots to the pan, pour the remaining oil over the top, season with salt and pepper and then roast in the preheated oven for 1 hour until golden brown on the outside but still pink and moist inside. Remove the lamb from the tin and wrap it in foil to keep warm. ✱ Put 100ml water in the roasting tin to deglaze, then return it to the oven and cook for 3–4 minutes until reduced. This will gather all the flavours from the caramelization of the meat and give you the concentrated juice you need. ✱ Unwrap the lamb. You will find some juice has also gathered in the foil – add it to the juice in the roasting tin, stir and set aside. Slice the lamb, then drizzle it with the juice, sprinkle with the remaining lavender flowers and serve with sautéed potatoes. ✱ Chef’s tip: While lavender is a stunning match with the lamb, this dish can be made with more traditional herbs, such as rosemary and thyme, or any other herbs of your choice, to create your personal twist. If you enjoy French gastronomy you may be interested in our sister website’s new French foodie bible ‘Taste Of France Magazine’ which is set to be the best thing since sliced baguette! You need to Login/Join to post a comment.